The fluid indoor water rower is the closest thing to real rowing and has been crowned Best Rower 2009 by Mens Fitness Magazine. Yet again First Degree gym equipment for sale takes the lead with another high quality commercial indoor rowing product. 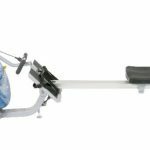 The E-216 Fluid Rower is the closest thing to real, on-water rowing with a natural catch and resistance through the stroke! Plus, it has unmatched durability! The new, unique and technologically advanced E-216 Fluid Rower by First Degree Fitness is one of a family of superb exercise machines that has revolutionized the way people exercise all over the World. This First Degree Fluid Rower is a fabulous exercise machine that effectively engages almost every muscles in the human body. Our new Direct Drive System (patent applied) puts you in direct contact with the water. No chains or sprockets interrupt the smoothness of the rowing action. Using Dyneema® cable, the world’s strongest fiber™, we have developed a special pulley, attached to the central shaft of our Fluid Tank. As the Dyneema® cable unwraps from one end, the bungee recoil cord winds on from the other end. At the completion of each stroke, the process is reversed. All you feel is the resistance of water. All you hear is the sound of water. Perfect! Dyneema® is a super strong, polyethylene fiber that offers maximum strength combined with minimum weight. It is 15 times stronger than quality steel, on a weight for weight basis. Dyneema® is extremely durable and resistant to moisture, UV light and chemicals. It does not stretch, making it ideal for our application and delivering the smoothest, most positive and wear resistant cable available. All Evolution Series Rowing Ergometers are designed for ease of mobility and minimal space requirement for storage. 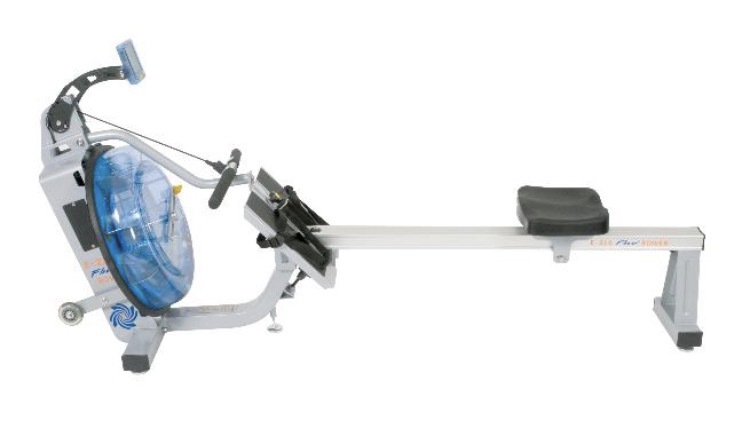 The rower includes large transport wheels and has been designed to store in the vertical position, requiring just 55 x 70cm (22” x 30”) of floor space. With all the weight in the front end of this machine, picking it up and moving requires minimal effort and vertical storage is safe and stable. First Degree Fitness warrants that the E-216 Fluid Rower, purchased from an authorized agent,is free from defects in materials and workmanship. First Degree Fitness or its agents will, at their discretion, repair or replace parts that become defective within the warranty period. First Degree Fitness will repair or replace the metal Main Frame of the Rower should it fail due to any defect in materials or workmanship within 5 years of the original purchase. Warranty does not apply to frame coating. First Degree Fitness will repair or replace the polycarbonate tank or seals should they fail due to any defect in materials or workmanship within 2 years of the original purchase. First Degree Fitness will repair or replace any mechanical component should it fail due to any defect in materials or workmanship within 1 years of the original purchase. First Degree Fitness will repair or replace any component should it fail due to any defect in materials or workmanship within 1 years of the original purchase. The First Degree E216 Fluid Rower uses water as it’s form of resistance. This is the most accurate manner in which to simulate actual outdoor rowing and provides a smooth and consistent sensation throughout the range of motion of the exercise. The natural, soothing sound is an added benefit of the water and contributes to a relaxing and comforting workout experience. Water has unique “cube rule” physical properties, which mean that to go twice as fast through it requires 8 times the effort! So as the athlete increases workout intensity, the Fluid Technology resistance unit responds instantaneously.